This was one of the items on my 30 Before Thirty list. We’ve lived here for three years now, and the front has been a bit bare the whole time. There was a dead Rose of Sharon that we removed, but not before leaving it up for a year first (“maybe it will come back!”). We also added some hostas (free from my dad’s house) and two boxwoods (small, and not holding up so well). I feel like there’s more pressure to make the front of the house look nice because that’s the public part that everyone sees. I’ve been having fun experimenting with the garden in the back, adding and subtracting, moving and rearranging plants as I see fit. And it’s looking pretty cute back there! But the front? Nope. The front has remained bare because I’m too afraid to put the wrong plants in. Yeah, well guess what I did. I went to the nursery looking for some flowers and a bush. I got five astilbes (good choice! ), but then I also got an Ivory Halo dogwood (wrong choice). The flowers are excellent in the shade, which is what the front of the house gets. The bush is supposed to be in full sun. I didn’t even look at the tag because we have three of the dogwoods in the backyard getting partial sun, and I thought I remembered them being OK in part sun to shade. Wrong. So now I’m not sure if I should move it (to where, I don’t know), or take my chances and hope it survives. Oh, and the front of the house still looks pretty bare. The Better Homes & Gardens website has some fabulous landscape plans for many different sizes of yards. I used one for inspiration & guidance, and my front yard is now gorgeous. If you have a small problem area, sometimes a nursery will give you a freebie plan for your yard to encourage you to buy the plants & the nursery’s services. Please, move the dogwood. You might as well put it in a better environment and get your money’s worth out of it. I feel your pain – I find landscaping such a challenge!! It’s so hard to know what plants work where – and which ones you LIKE that work. Your backyard does look fantastic, though. Your best bet is to go to a local nursery and talk to the staff. I’ve received invaluable help in figuring out what will grow in our shade garden. Hydrangeas are a good bet. And maybe rhododendrons, depending on the amount of sun and wind exposure they receive. We also planted solomon’s seal, and it’s the most gorgeous perennial that adds a bit of height. I am crazy about this plant. As for annuals, begonias go crazy bananas in a share garden, and they mound quite nicely. I’m in a constant battle with the front landscaping. I feel your pain. I just figure one of these days I will figure it out. I have a front shade garden a few blocks over. Still filling in, as I just removed all the remaining grass (ok bare spots and weeds). Hydrangeas do well, as do azaleas the shrubs. I also have a fothergilla, which provides some interesting texture and fall color. I’m finding the real trick in the front space is figuring out heights with shade plants, so many seem to be small. -Bleeding Heart: I have a pink one and another white one – they look beautiful when flowering, but the foliage is great all summer. -Peony: It may take a few years for it to flower, but if you buy a more mature one initially (more expensive), it may bloom the first year. It will only get bigger each year. -Japanese barberry bush: This is the first year for this one, but so far it is holding up really well. -Tulips. Plant some bulbs in the fall and they will come up in the spring – they may be kind of smaller the first year, but they will only improve with time. I’ve also heard that Solomon’s Seal is good. Good luck! Yeah my mom has been supplying me with tons of Hostas. Check out craigslist for plants, many people need to thin out their gardens and you can get good deals. I’m a new gardener, but I’ve already learned that plants are as unique as people and don’t always conform to expectations. I’ve inherited several huge, happy rhododendrons in a full-sun location when they supposedly prefer partial shade. What I’m trying to say is- if you’re willing to experiment and possibly move or replace it, why not? I have an Ivory Halo dogwood in partial sun and it’s doing great. I think the suggestion for full sun is that the shrub needs a lot of sunlight to really develop the red branches (which is why most people buy the plant). But, I love the leaves of the dogwood so if it doesn’t get really red branches, I don’t really care. I suspect the dogwood will do just fine in partial sun/shade for you. We live in the Edison Park neighborhood and this weekend we finally (after 3 years) planted the front yard! It previously had hideous overgrown bushes that we removed last year and it has been bare ever since. This weekend my mother-in-law came over and helped us pick out plants and plant them in the yard. It turned out quite nice and we were told everything should do well in the Chicago weather. 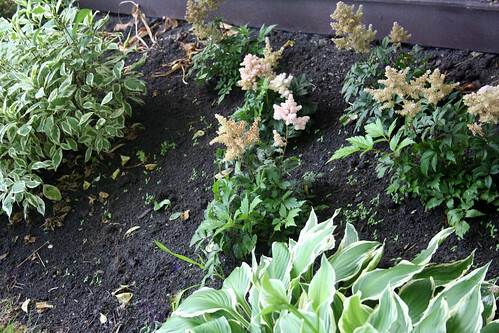 We planted Japanese barberry, hydrangea, peony, and some geraniums. We are going to get a lilac bush as well. But it’s all really colorful now and looks great. That’s such a sweet little nest you have. Hydrangea; I’d recommend Incrediball (huge white flowers with sturdy stems), Invicibelle Spirit (new pink flowered hydrangea from the same family), or Little Honey (very unique dwarf hydrangea with chartreuse to purple foliage and white flowers). Endless Summer doesn’t do well for even master gardeners in my area. Is there a native plant resource near you that you could learn from to identify some native & pollinator-beneficial plants? Our ecosystem really needs help every way it can get it. If we all planted native, low-maintence landscapes that provide habitat and food for our local pollinators, together we can create acres and acres of eco-friendly space. You aren’t happy with your front yard right now – take that opportunity to make a difference for your local bees, bugs, butterflies and birds. I don’t think anyone mentioned huecheras. There are several colors of them now. Also, euonymous and there is a bush I have that has longish pointy leaves that are green with yellow spots and is evergreen (at least here in zone 6) that grows well in the shade. I can’t find the name for it. Also, I have a forsythia and mock orange that grow in light shade. Your problem might be too many possibilities! I have focused my gardening energies on the front and side yards for the last 3 years (and completely neglected the back). Even with adding plants every year, it has taken three years for it to look not totally barren. Part of that is because I don’t buy expensive mature plants. Most were free transplants from other yards and I’ve left room for all of the plants to grow to a mature size (leaving a lot of bare space around them). I moved somethings around this spring to fill in empty sections and plant annuals (zinnias from seed) around the tiny hydrangea since its mature size is 5 ft! I am in the process of getting estimates from landscapers to give us a hand with our yard. The front is kind of sad and sparse in grass, and the flower beds are kind of out of control. And there is a former veggie garden in the back that just frightens me, and now we have a sand pit where the pool used to be. You see all of this is left over from the previous owner, we bought in Sept so she had neglected it, and we did as well. We are hoping to bring in the professionals to overhaul it so we can maintain it. I feel your pain, and good luck. BTW we just got a Rose of Sharon from my in laws it was a chunk from their plant and I don’t think it survived the transplant process it is so sad and we too don’t want to take it out and admit our failure. If you’re looking for something full and bushy – you can try Plumbago – its very easy to grow and gets those beautiful periwinkle colored flowers. Or there’s always Lantana. You can. not. kill. Lantana. I’m serious. And it comes in various colors. Both these plants – you can whack back to the ground if they get too big, and they’ll still come back next year. Only if you live in Florida or other southern zones. In the North lantana is an annual and so is plumbago. Sad, because they are beautiful. Love your blog and have been reading for a long time. I moved into my in-laws house (my mother in law had the most amazing plants) and I was really scared to get all her plants along w/ the home. For fear I might kill something. I had a gardener and landscape architect come out just for a day of consulting, they walked the yard with me and gave me info on all the plants. They even offered to go to the nursery with me to pick out options for filling space, etc. Most people can be paid by the hour. Having them there for the day (while I took copious notes) was so helpful. Now I know what goes where, how to trim, and can call anytime to bring them out for a few hours to consult on any issues I come across. I suggest hiring someone for the day to give advice. Helped me a ton. 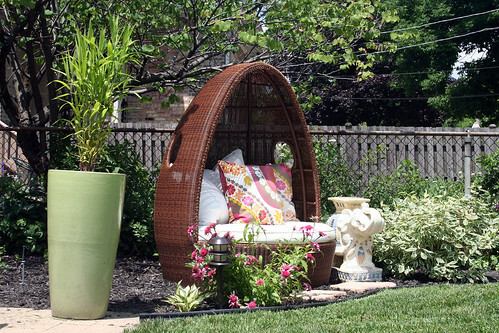 I LOVE that willow chair! I would love to have something like that in my garden! I did a post not too long about about shade loving plants – maybe it will give you some ideas ( http://droppedstitches72.blogspot.com/2010/04/made-in-shade.html ). If it’s not thriving, then do move it. It’s no fun to see a struggling plant every time you come home or sit on the porch. In its place you might want to try Viburnum plicatum ‘Summer Snowflake’ … mine loves part shade, and it blossoms all summer and into the autumn. people grow lantana on purpose?? i can not imagine. in australia it is considered an introduced pest weed, it chokes every other plant. no one would ever grow it in their gardens. it’s definitely hardy though, and i’d agree that nothing kills it, i try any time i see it. But, if you are looking for something totally awesome in shade try to find Clethra!!! Hehe! I’ve been in my house for over 3 years now, and I still have not landscaped the front either… It really gets pricey, and I don’t have a green thumb =/ I just figure it would all die anyways lol. I’d move your dogwood to your sunny backyard, and add some hydrangeas. Looks like everyone is saying hydrangeas, but they are SO awesome. They fill in quickly – if you buy already well leafed and blooming gallon size ones like I did to add to my very sparse front when I bought my house – you’ll have full size plants in two years. They take to pruning well, so you can keep them at the size you desire – big or medium-small. I second the Incrediball hydrangea suggestion – huge white mophead blossoms. It’s too bad Endless Summer doesn’t do well in your climate zone, as they are lovely, too. You are getting some excellent advice from your commenters. 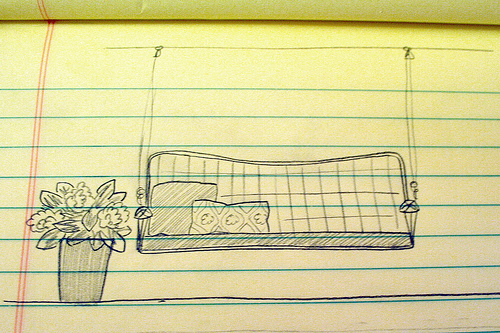 I’d chime in, but cannot keep a cactus alive. I adore your beautifully landscaped backyard, though, and am sure that your magical touch will work on the front soon. I’m having the same problem with my front yard. So far I’m having great luck with huecheras/coral bells for the shady parts of the backyard. They come in some lovely colors and you might find some that are native to your area. I’m really luck to live near Terrain. They have some amazing plants!! Oh your backyard chair corner looks so serene and cozy! I’m struggling to get height and flowers in my new front yard. . . I think that hydrangeas can be iffy – I know so many people who’ve had trouble with them. I really like Michigan Bulb (catalog or online) for ordering plants and flowers. They have better prices and healthier plants than your usual Home Depot, and they can really help you put together just the right plan for your space. If may want to try some herbs. I just built a shade box in the back and filled it with herbs. Some are for scent (patcholi) and many are for eating (chocolate mint, orange mint, parsley). They are cheap, provide greenery and safe for your babe to eat (if she in into garden exploring). My house faces north. I have a variety of shade plants. Have you looked at the Oak Leaf Hydrangea? It is a wonderful, large (about 6′ to 7′ at full height) plant during summer, wonderful large flowers that start out cream and go to pink, and also has winter interest with its exfoliating, cinnamon-colored bark. I also have a climbing hydrangea. Not known for the flowers, but foliage is great all summer long and looks great climbing on the house. Another of the most wonderful shade-loving plants is the Variegated (make sure it is variegated and not the regular)Solomon’s Seal. It is green and white and fresh-looking all summer long. At full height (after a couple of years) it stand about 34″tall; very slender and arches gracefully. It spreads slowly, (not invasive) so if you want to share it with others, it is a very easy thing to do. I have others…one being Sweet Woodruff. A very soft, dainty, ground cover that is not invasive. It, too, stays fresh and green all summer long. These are a few of the easiest shade-loving plants I have. Actually they are all easy. My house is not large; 1000 square feet and I have these plants and more just in front of the house. FYI Solomon’s Seal is poisonous if ingested by pets or children. Oh, I just remembered, I also have the Annabelle Hydrangea. You cut it back in the fall. It is different than the pink or blue hydrangeas. It grows tall and has huge green to cream colored flowers on each stem. Very easy and you don’t have to worry about blossoming. It always does (later in the summer). This is one of the few times I’m glad not to have a yard! Your backyard looks so peaceful and lovely– I can’t imagine that you’ll go wrong in the front. Besides, part of the fun of gardening is experimenting. I agree with the Sweet Woodruff for gound cover. It seems to need not much water (I live in Utah and this is crucial). I have a north facing house and put a few ornamental grasses in and they seem happy too (Karl Forrester Feather Reed Grass- grows 4-6 feet tall. Looks goog year round…). Hostas do well in shade but need more water than I can remember to give. I have written twice before about the garden. I have to tell you about one more. It is best in sun but is absolutely beautiful all spring and summer long…flowers are a striking indigo blue…they bloom in May and June, then pods….but the foliage is a blue green and stays fresh all summer. Very easy and does not like a lot of water. It is False Indigo (Baptisia). It gets quite large after a few years. It has a taproot; doesn’t like to be moved, but it can be done. I also want to mention that I live in Northern Michigan. If you send me some photos of what you’ve got planted, I’d happily come up with some suggestions! I’m in the Chicago area too and we have a similar style and similar home and it seems similar budget. I love your blog and wouldn’t mind coming up with some planting ideas, I am actually working on a cheap&chic garden section for my blog so I wouldn’t mind giving your front a whirl! I might add that I’m a landscape architecture student with a horticulture degree who is just a little bit obsessed with garden design.